eBay is a competitive shopping channel and shoppers commonly use “price + postage” lowest option when they search so your chance of winning the sale is minimal if you are 50p more expensive. This is when repricing plays a very important role. I have worked with eBay for the past 10 years and my involvement at the start was purely managing and optimising eBay performance for a discount retailer. Price check was the first thing we did when stock landed on our desk. There was no point selling/listing product if we could not be competitive enough. It was a manual and very tedious task but now with software like StreetPricer you set your floor price and set a formula to lower your price and the system works for you to win the sale. This post has been put together with Cardy Chung, founder of eBay repricing tool, StreetPricer to highlight how repricing can help your eBay sales. #1 Is eBay focusing on low price more than ever before? eBay is an attractive marketplace to buy established branded products at bargain prices. Sellers are under pressure to provide better prices – otherwise, they would find it difficult to survive. 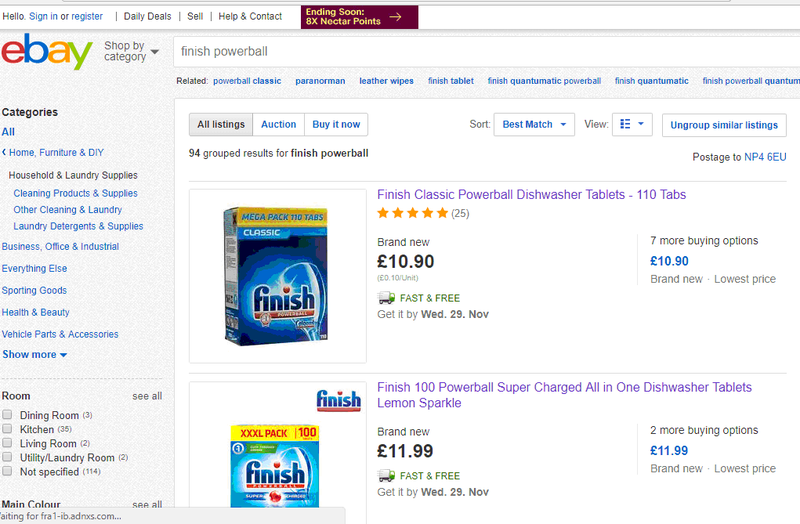 eBay’s aim of imitating Amazon’s one-page system is actually delivered with structured data, which eBay calls “item specifics”, such as EAN, UPC and MPN, and shoppers are presented with “Group Similar Listings” as shown below. These products are grouped together based on EAN/UPC of the product. The choice is mostly about price – as delivering “great deals” is eBay’s marketing strategy. Check out this search result below to see how “group similar listings” work. #2 How do you ensure competitive repricing? The usual practice is to check your top selling lines or worst selling products against competitors continuously. This is generally done manually in-house for the low number of SKUs and outsourced when there are larger numbers. The manual process becomes relatively difficult once your inventory grows beyond 200-300 SKUs. This is when an automated tool like StreetPricer solves the problem. #3 Do we really make money when we continuously reprice? Your margin may not be as high as you would like but on balance, it is better to sell with lower margin compared to not selling at all. A higher turnover makes it easier to cover your fixed overheads and allows you to build scale in your business. #4 What sort of rules can we set with StreetPricer? You can choose to match the Lowest, 2nd Lowest, or 3rd Lowest, with an offset. The offset could be positive or negative, and it can be expressed in dollar value or percentage. Most of our customer either opt for matching the Lowest exactly or matching the Lowest with a +50p offset, i.e. 50p above the Lowest. In addition, you can also apply a location-based price differential, e.g. if a product is being delivered by your competitors from outside the UK, then price your items at, say, a 10% premium. This allows you to maximise your return if you keep your stock locally. Similarly, you can also apply a Handling Time-based price differential. #5 How does Artificial Intelligence help on eBay repricing? Our Artificial Intelligence (AI) algorithms mimic your logic and thought processes as a seller, with focus on relevance and self-learning. It analyses your inventory and for every one of your SKUs, it applies AI logic to search for competing listings on eBay. Not only does it search, it also determines the relevance and the likelihood of the match. If it is sufficiently confident that a competing listing is indeed a “foe” listing, our AI logic will lock onto it on our “radar” for tracking. #6 What if my competitor is using StreetPricer? What chances have I got? Chances are some of your competitors are already using StreetPricer. So if you are not using it, you could be at the receiving end of our AI algorithm. Having said that, every seller sets the floor prices and AutoPrice rules differently, so there is plenty of room to differentiate your products and pricing policy against others. #7 How is StreetPricer different to other similar tools? We use Artificial Intelligence and we are the leader in search algorithms. Our AI-based search delivers almost identical results to eBay’s new AI based “Group similar listings” that was released on 9th Oct 2017. Translating it into day-to-day use, there is no need to supply keywords or ItemIDs, in fact, there is no need to supply any of this information to our software, as our AI algorithms will analyse and work it out. #8 What are your prices? Our starting price is £55.00 (US$75.00) and it will be the best £55 you ever spent on your eBay business. Our customer is very loyal and our retention rates speak for itself. It’s a monthly based subscription with no lock-in contracts because we know our customers see the return on investment. #9 Do you provide support for the initial setup? Indeed. Our support team works with our customers during the implementation and set-up phase. We want our customers to benefit from every feature available and to be successful.